You guys! I know you’ve seen me wearing this shirt and you’ve been asking for the cut file – I meant to get this up last week, sorry it’s taken me so long! But without further ado, here ya go, the Slay the Day SVG Cut File. This post may contain affiliate links. If you’re looking to stock up on vinyl, people always ask, I get all of my vinyl from Expressions Vinyl, they’re my favorite! Heat Transfer and Adhesive Vinyl. Just enter your email in the box below to get access to the FREE Cut File or SVG for Slay the Day. 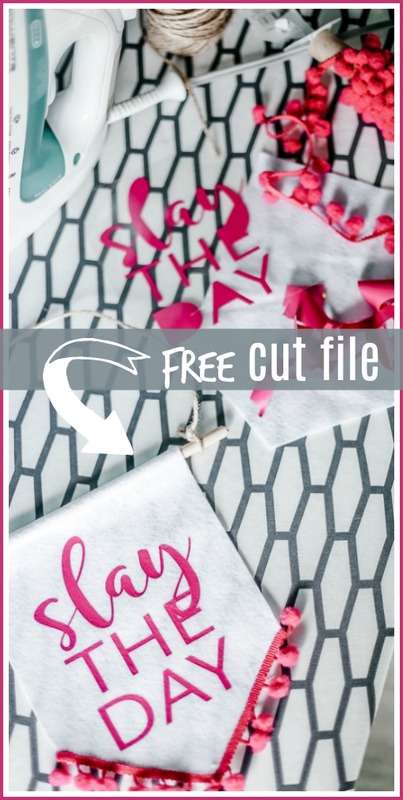 I also have other FREE cut files on my FREE Silhouette Cut Files page, you can find that HERE. 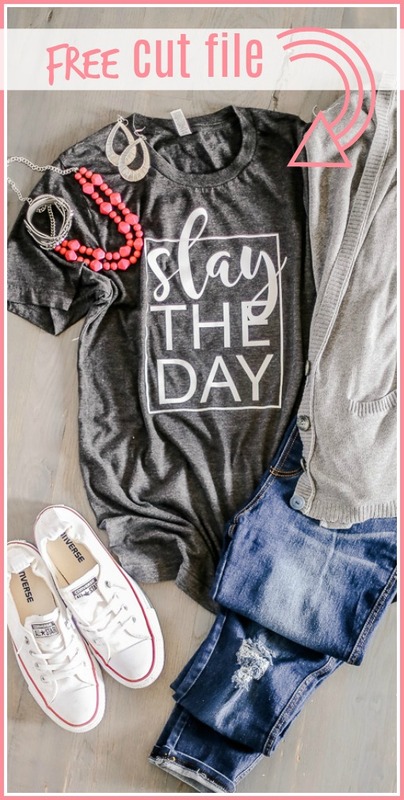 And if you love motivational tees, check out my Beat Your Best cut file too! Enter your email address below to get the free cut file, SVG -OR- Silhouette STUDIO. You’ll be taken to the file and be able to download it from there. Click your browser back button after you download the file to get back to this page. By entering your email address, you will be added to the Sugar Bee Craft Club email list and can unsubscribe at any time. This is adorable!! My daughter would really love this shirt. Thanks for sharing. This is so cute! I especially love it on the shirt!!! Hi Mandy! I would love to make this shirt on my circuit! Would you be able to make a svg link?! Love your Blog and YOU!!!! Would love to have Slay the Day in a SVG. Just discovered your website, you are crazy talented! Just wondering where you got your gray tee-shirt ? HI Mandy! Would you mind sharing what particular shirt this is on the Jiffy website? I love the style and want to try and get the same one. Yes!! I would love the Slay fie in svg too!! Hello Lovely, are you still offering your “Slay the day” file in SVG? I have a Cricut & don’t know how to convert files. TIA!! 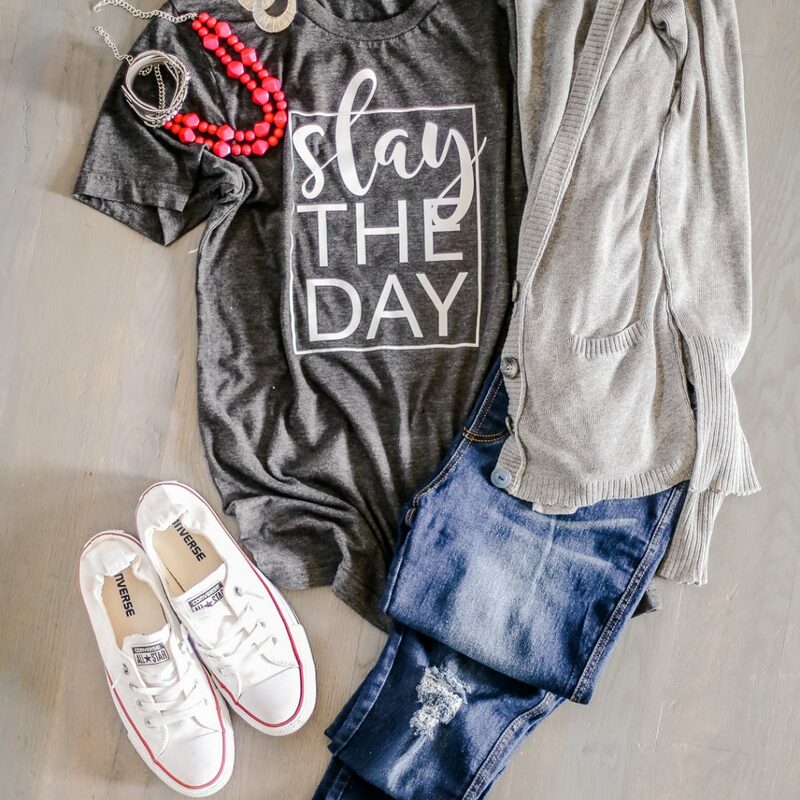 I would also like the “Slay the Day” SVG if it is available. I am overlooking were the download link is? You should be able to download either the Studio Cut File or the SVG- is it not giving you the SVG option? I’m new to your site and downloaded Slay the Day file but can’t open it. It went to my Google drive & shows 3 different formats. When I click on the svg file there is nothing there. Ialso tried downloading, but again, page is blank. I’ve never had a file sent this way so obviously am doing something wrong. Thanks for any help and happy to find your site. Hi Tammy! Are you opening it with your Silhouette or Cricut software? It’s a cut file, so it’ll only open within a program that uses SVG. Hope that helps. You can email me if it keeps giving you issues!